Please note that dinner will be available until 9.00pm on The Terrace. A unique restaurant with terrace, bar and café overlooking the bustling Borough Market; Rabot 1745 has the polished elegance of a Saint Lucian plantation house stylishly transported to the heart of London with authentic touches like hurricane-felled Ironwood, brought home from their own 250-year-old cocoa estate. The Rabot Terrace brings the Saint Lucian party spirit to London this summer! The open-air dining space is a free spirit just like a Saint Lucian ‘jump-up’. A relaxing island get-together for drinks, food and music outdoors after sunset. Please specify a terrace booking in the special request box. At heart of London’s most exciting food market, Rabot 1745 offers a ‘cacao cuisine’ menu featuring contemporary dishes influenced by the West Indies and Britain, with the savoury richness of cacao used as a subtle garnish, infusion and spice throughout. Rabot 1745 is a unique restaurant and bar, offering innovative cacao cuisine and the polished atmosphere of a Saint Lucian plantation house transported to the heart of London. A true cacao haven, it returns this ancient ingredient to its rightful place as an elegant infusion and subtle spice. Fresh Scottish salmon Ceviche, a cocoa pulp and lime zesty marinade. Atop avocado and tomato, a delicate lychee-like cacao pulp sorbet. 'Serve chilled' made exceptional. Spoon or fork? Lavish your way. Strawberry jam, clotted cream or 70% chocolate ganache first? Nice ambiance, however service was very slow and little/no accommodation of those with allergies, even with advance notice. I have been a fan of the products of Hotel Chocolate for a few years. Their Velvetiser hot chocolate machine is just superb. SO when I learned they had a restaurant, I just had to give it a try. It was my good friend's birthday so we booked a table and spent the whole evening there, from 6pm until they closed at 10pm. The ambience was good, the service was absolutely excellent, and the food was perfect - we chose some different items, which all had some chocolate connection, and found each item was delicious. We also tried the house cocoa beer - very good, but their cocktails simply crowned the evening, particularly the Salted Caramel Soother! One small criticism, the prices of the cocktails were £2 more than on their internet drinks menu!!! Excellent service from very pleasant waiter which along with great food made it a memorable day. For a group who pride themselves in always visiting new places and not revisiting event the best restaurants, this will be a rare exception. So many mouth-watering dishes to choose from and no regrets (other than the limit to what we could eat in one sitting!). White chocolate mash - inspired! We shall be back! Very tasty food. Every bite was delicious. Love this place. Great find. Went there for a Birthday meal. Food & drink of good quality. Our waiter Pavez was very knowledgeable of the menu & gave good recommendations. We would defo go there again. I went with my daughter and sister for my sisters birthday. I’m not a huge chocolate fan but the food was delicious. Beautifully presented, good size portions and really well cooked. I had the halibut. The skin was crispy and the flesh perfectly cooked. The lime and coconut sauce was totally delicious. Staff were really friendly and helpful and we had a lovely evening! Amazing food! My goodness it was delicious. I’ve been before and was keen to return and immediately was reminded of why my last dining experience was so wonderful - outstanding service (above and beyond), exceptional food and a lovely atmosphere. The food was excellent as was the House Prosecco. The sweet of Rum Baba was a little on the large size with 3 sponge balls, albeit the rum sauce was astounding. Maybe go back to a tradition shaped sponge, but keep it small. The chicken, marinated in rum for 24 hrs, was outstanding, so full of character and the scallops starter was cooked to perfection and just the right amount of garnish. Overall a very good evening with the only niggle being that the door to the outside deck was open and it became very drafty and chilly in the interior part of the restaurant. Our smiling waiter Pavel, made up for that with his excellent, not intrusive attention, to our needs. Overall, a great experience marred by the unpleasant cold draft. Very accommodating, excellent service and the food was very good, fabulous flavors. Friday night was very busy but service was excellent and helpful with choices. Excellent from start to finish. I want to bathe in the plantation sauce that came with the chateaubriand. Great food. Very different choices from "the norm". Very well presented. Reasonably expensive so very nice for a treat. Met a girlfriend here this evening and this here cacao aka chocolate infused food was a first for both of us and we weren't disappointed. A Caribbean twist on some dishes paired with others that left us wondering what to try for fear of missing out on what on paper, looked like a variety of palatial experiences. Good service and more than enough to keep us satisfied. Unfortunately we didn't have space for dessert which means we will no doubt have to make a second visit. Although sounding clichè, we'll be back! Amazing food. Fantastic service. Great way to celebrate my birthday. My new favourite London restaurant! Lovely atmosphere. Saturday night and it was full but it wasn’t noisy or crowded. Food was delicious and not overpriced. Overpriced and I did not enjoy my main course. Some of it was cold. My husband didn't like his fish.The service was varied. Some plates were cleared, others not. I didn't want to say anything at the time as I didn't wish to spoil our daughters evening. As always, we had an amazing birthday celebration at Rabot. The service is second to none (thank you Pavez!) and the food is to die for. We loved the new cocoa infused Chateaubriand with white chocolate mash. There was a glitch in my booking and did not flag to the restaurant that it was my birthday, so when they heard it they gave me two boxes of gorgeous chocolates to make up for it. It was the loveliest thing ever. We will be back soon for the afternoon tea. A really different but thoroughly enjoyable experience. Great staff and service, quality food with amazing chocolate tastes. A fantastic place to celebrate wife’s (milestione) birthday treat, with good view of market from outside tables. Food absolutely fantastic and well worth the money. Service was second to none. Will recommend to friends and family. Can’t wait for the next trip. Been here many times and love their food! There service was fantastic, very attentive, very friendly and nothing was too much. The food was so tasty, especially the triple cooked chips. I think there could have been more food on the plate for the starter but it was so tasty. Overall we had a lovely experience. 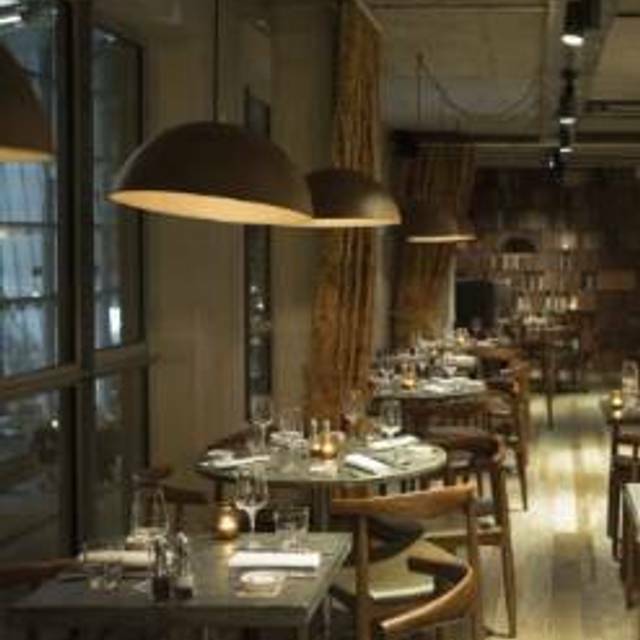 Very nice and cosy ambience, inetesting dishes but not all of them "wowed" our party. Chocolate ganache served with Chateaubriand was overpowering the steak (but delicious on it's own afterwards), slow-cooked beef was rather on the dry side and didn't have enough glaze to go with it, chocolate mousse selection was way too sweet. On balance, scallops were delicious, venison was cooked to perfection and very well balanced in flavour, and their hot chocolate is always winning 5* marks. We've had a lovely night and were well looked after by the staff, so we might be back at some point to try a new menu (but will definitely come back to the bar for more hot chocolate). Piton pulled pork is so good. As a one off experience I liked the novelty and was drawn by the fact it is owned by Hotel Chocolat but the food did not blow me away. It was nice but not value for money. Service was excellent from the waiter although initial impressions were poor as we stood for a few minutes without being acknowledged. It was a lovely experience with the family, they were accommodating for children and service was impressive a really relaxing, enjoyable time. Wonderful night catching up with friends in a fabulous restaurant with a chocolate focus... never before have I dipped my chips in chocolate ganache but the combination was a great experience... if only I had had space for a bigger dessert. I will be back. Delicious food, consistently great. Hot chocolate is a must-try. Excellent friendly helpful service (Fabio). First course (scallops) was fine. Main course was problematical. Sweet potato chips were cold and soggy - really bad. We complained and they replaced them with sweet potato fries that were warm but very slimy and soggy. One part of the main dish was a vegetarian curry. It was cold so we sent it back. It was replaced with another which was hot but awful tasting. This was our 3rd visit but I think it will be our last. Restaurants can experience problems, but a good restaurant would send the manager over to investigate and compensate. All we got was a free drink. Wonderful staff, very attentive and friendly - great service. The food was all delicious and there was enough choice for anyone to enjoy. Very good cocktails too! A great selection of quality food. We both went for the Hereford beef in Yorkshire pudding to start - melt in the mouth beef, crispy pudding and divine reduction! I predictably went for the burger with bacon for my main - simply wow!! Other half went for mac n cheese - another wow!! Dessert was a taste to be desired. I went for the molten lava which was absolutely off the charts for taste and texture! Wife had the three mouse plate which was incredible. Overall, loved the venue, service, value and selection. Avoid sitting outside when the cleaning of the Market is going on though. That was our choice to sit outside though 😜. Definitely would recommend this restaurant. The rum selection is incredible. Sitting downstairs for pre-dinner drinks amongst the choccie delights is awesome!! I went to Rabot on Saturday for an early lunch with my boyfriend. I liked the atmospheare and the design of the restaurant inside, as soon as we sat down we ordered a couple of cocktail which I wasn't really impress by. We ordered a sharing platter as starter and venison as a main. Even hough the starter was more beatiful to watch then really oustanding taste, I have been impress by the meat, tender juicy and with an exotic chocolate taste. But the main piece it has been the taste of the pulled venison served wuth a disk with spinach, so tastful and very hard to forget. Everything has been washed with a very nice portuguese red wine reccomended by the waiter. It has been a very nice expereince as a over all but maybe next time I'll get main and dessert rather then starter.